Do you like to maintain a reputation as the “cool mom,” the “hip” host, and the friend who always knows how to plan a fabulous outing? If fine dining, spa treatments, and cocktails on the front porch swing sound like your idea of a good time, you can indulge to your heart’s content at the Sanford House Inn & Spa or the Thornton Inn Bed and Breakfast, located in historic Downtown Arlington. Pair an overnight stay (or two!) with a concert under the stars at the Levitt Pavilion, a show at Arlington Music Hall or a Texas Rangers game, and you’ve got yourself one sweet getaway. Two: Shop at the store with the biggest selection of Texas items in North Texas! Gene Allen&apos;s has been an Arlington staple for over 50 years - with everything from Texas pillows, original Texas hot fudge and even fine pewter serving plates in the shape of Texas, Gene Allen&apos;s is the place to go to find your homesick Texans gifts that remind them of home. Decorators Warehouse is a true shopper’s paradise that offers an acre-plus of Christmas and holiday decorations—and as a bonus, there’s the Rose Garden Tea Room or the store’s TV lounge when you’re ready for a break. Intriguing destinations in and around Arlington include Arlington Cemetery, the Early African American Cemetery, “Dimebag” Darrell Abbott’s gravesite (the final resting place for the legendary lead guitarist for the rock group Pantera), and Lee Harvey Oswald’s gravesite. A little 1930s-styled gangster, that is. One of Arlington’s most interesting destinations is Arlington Baptist University, the former home of Top O’ The Hill Terrace, a famous Prohibition-era tea room and casino that’s full of incredible stories and wonderful historical photos. Any-sized group tours are available by appointment. When the superwomen of the WNBA Dallas Wings needed a home for their brand new team, they came straight to Arlington—of course! You can catch the ladies’ action late spring and summer at UTA’s College Park Center, where there are also plenty of things to do before and after the game in the College Park District or in Downtown Arlington. Disc golf fever is all the rage at beautiful Veterans Park, where people of all ages and abilities can enjoy the satisfaction of this addictingly fun sport. While you’re there, you can also check out the park’s hike/bike trail, the equestrian trails, nature area and wildscape gardens. 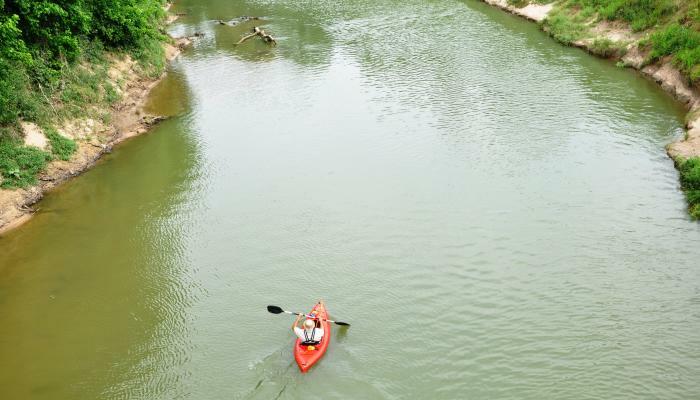 Discover a different kind of outdoors experience on the Lake Arlington Paddling Trail, where novice and experienced kayakers alike can enjoy some quality alone time or some watery group adventures. Ever noticed that everything’s more fun when you’re on wheels? Check out Arlington Skatium, where old school wooden rink nostalgia meets up with 21st-century bells and whistles—and that means good times for kids of all ages (and kids at heart). If you haven&apos;t yet discovered the foodie&apos;s paradise that is Whole Foods Market, you&apos;re missing out! The gourmet organic grocery sells everything from artisanal chocolates to craft beer to healthful heat-and-serve meals; plus there&apos;s an on-site deli and a coffee bar to check out, as well as monthly cooking, food selection, and savvy shopping classes. Those super-affordable grandstand seats are all kinds of fun, but there’s nothing wrong with splurging once in a while and enjoying air conditioning, flat screen TVs, private restrooms, or all-you-can-eat grub in one of Globe Life Park’s luxury suites, the Hyundai Club or the Cholula Porch. Say “Namaste.” The Arlington Yoga Center offers walk-in classes, bundled packages, and unlimited monthly yoga, with instruction in a range of multiple yoga disciplines. Beginners are always welcome. It’s possibly the most instantly recognized image of our fair city, but have you actually ever been to the top? Offering stunning 360-degree views at 300 feet from the ground, the legendary Oil Derrick is a truly bucket list destination for anyone who lives in or visits Arlington. Check out everything from the locker rooms to the press boxes to fine art exhibits and more when you take an up-close tour at the venues the legendary Texas Rangers and the Dallas Cowboys call home, Globe Life Park, and AT&T Stadium. What’s made up of talented artists from around the world, known for frequent performances of beautiful music, and likes to call the historic Arlington Music Hall home? It’s Symphony Arlington, and we can just about guarantee you’ll be glad you spent an evening getting to know them better. Or mosey on down to the Arlington Museum of Art, where the nationally-coveted Vivian Maier: Lost and Found exhibit showcases the work of a posthumously-discovered photographer by hobby and nanny by trade. The discovery of her amazing photo collection spawned a documentary that’s currently showing on Netflix and a national traveling exhibit that’s making a summer stop here in Arlington. Beautiful Tierra Verde Golf Course offers 250 acres of sweeping vistas, water features, sculpted fairways and challenging play—and yet it’s one of the most affordable golf top-tier golf destinations in the area. Be sure to stay for breakfast, lunch or dinner at Ventana Grille, the clubhouse restaurant. Free history and air conditioning —you can’t ask for more than that. Take a trip back to a fascinating past without leaving the comfort of your car when you go on this self-guided Historic Buildings Tour, which includes stops at Arlington’s better-known historic destinations and a few spots that might surprise you. And you thought that UTA was just a place to get an excellent education. That’s true, but it’s also the home of the UTA Planetarium, the UTA Fine Arts Gallery, the College Park District, and tons of exciting college sports action.